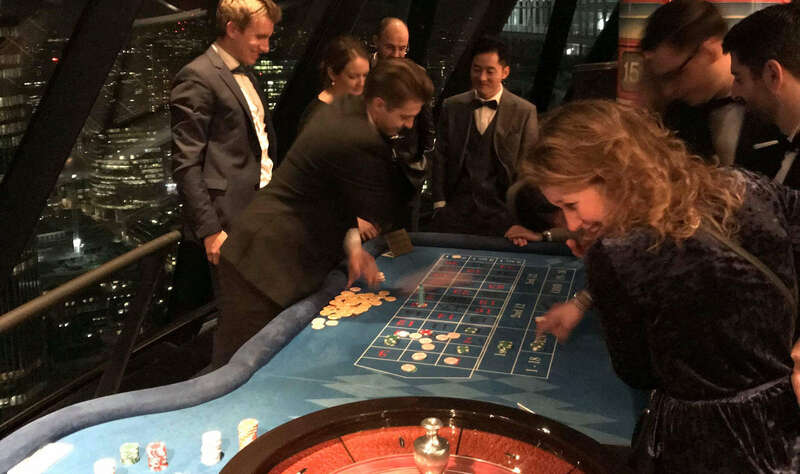 We pride ourselves on providing outstanding service teamed with experienced & hospitable staff & croupiers to ensure that every event is a success. Our reviews speak volumes! Unfortunately within the entertainments business there is a plethora of inferior & substandard equipment & staff offering their services. Don’t be fooled by swish websites that use misleading claims of being ‘the best’ and purchased stock images to give the impression of a professional set up, the reality behind the shiny website is often quite contrary to this. We have witnessed first hand other entertainment businesses arriving at the same time as party guests to set up, with substandard equipment spread across the floor & not working within a tidy area and ungroomed staff who have little interest in attending to guests needs & have certainly not worked in the hospitality industry previously. Claims of using professional croupiers can often be very deceptive. You may not be familiar with the workings of real casinos & casino games but it is likely that at least some of your guests have done so & will be unimpressed with the set up of an inferior casino business & so called ‘croupiers’ who think that standing behind a table called blackjack or roulette makes them a professional. For us, every event is special, every event deserves the best, we will be there for you on time, with great equipment and the staff to make your event as wonderful as it deserves to be. Here’s a selection of our genuine reviews from clients who we have been privileged to have provided entertainment for. I worked with Liz and Murat at Diamond for our company’s biggest awards ceremony, the World Procurement Awards 2018 on May 17. They were a real pleasure to work with, both pre- and during the event. Very responsive, accommodating and professional. They didn’t just supply what we requested, they went beyond that and were helpful onsite, too, delivering an outstanding experience to our guests. We worked with them in the past and we will definitely work with them again! Hired Diamond Fun Casino for our wedding reception as something a bit different for the guests and I have to say I was not disappointed. Turned up on time & setting up was really quick. Tables looked fantastic and the croupiers were great. They looked after our guests and topped off what was an amazing day. The personalised money was a nice touch too. Would recommend to anyone and will hire these guys again. Thanks again for making our special day even better!! Third time I have used Diamond Fun Casino; first for a wedding; second for a fund raising event; third was also fund raising. Always excellent! Diamond Fun Casino are incredibly professional. Their croupiers really know their stuff and their tables are of the highest standard – they’re large and plush, just like in a real casino. As an event organiser and host it’s very important to use reliable people and I know everything will go like clockwork when I use them. I highly recommend. Hired Diamond fun Casino for our Vegas themed party. It was very popular with the guests and kept them entertained for hours. Staff were very helpful and helped anyone that didn’t already know how to play. Would recommend. Fantastic event, the staff were extremely professional, but also fun! Communication was excellent with Liz, and I would not hesitate to recommend Diamond Fun Casino to anyone for their event. We have been booking this company for many years and everything is always perfect! Lovely staff, great equipment and an overall amazing service each and every time! We used Diamond Fun Casino for our annual company event. Our dealings with the company in the lead up and on the evening were everything we could have asked for. We wouldn’t hesitate to use them again in the future. We Booked the Mirror Booth for my Daughters 18th Birthday Party. And i must say the service was out of this world !! The guests had great fun and there was a queue of people all through the event it was liked so much. Murat was brilliant and I would highly recommend the mirror booth and indeed this company. Well done to ALL involved. I am so glad I done it and it is worth the money all day long.